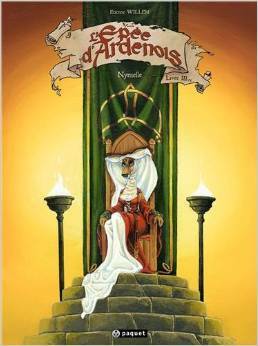 French anthro comic: L’Epée d’Ardenois – book review by Fred Patten. L’Épée d’Ardenois. T. 3/4, Nymelle, by Étienne Willem. Geneva, Switzerland, Éditions Paquet, February 2014, hardbound €13,50 (48 pages). 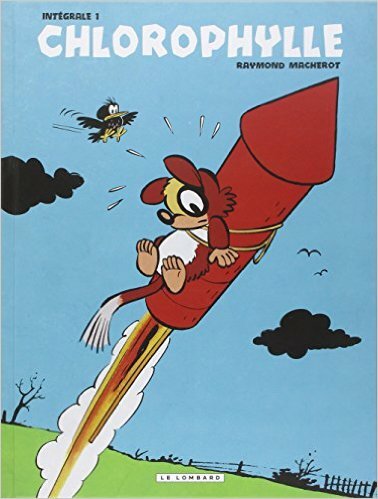 This is part of Lex Nakashima’s & my project to bring American furry fans the best of new French-language animalière bandes dessinées. Volumes 1 and 2 of this 4-volume series were reviewed on Flayrah on April 29, 2013. Here is volume 3, Nymelle. The warfare in the Medieval funny-animal realm of the three kingdoms has devolved into bloody chaos. Garen (rabbit), the young peasant boy who hero-worships the legendary Companions of the Dawn — four unstoppable knights who led the three kingdoms of Bohan, Herbeutagne, and Valdor against the demonic armies of wizard-king Lord Nuhy a generation ago, then retired – is eager to see them reunite when Nuhy’s army reappears under his “eternal captain”, Hellequin of the Cursed Wood (goat). But the Companions are old and out of training today, and Sir Godefroid (hound), who is Garen’s personal hero among the Companions, is carefully killed by Hellequin before he relaunches the war. The other Companions dubiously accept Garen as their squire to honor Godefroid’s memory, but they are all shocked to find that the three kingdoms of today are not what they were a generation ago. Then, they were three monarchies united by strong rulers working together. Now, they are three separate monarchies each under weak rulers who do not even have the support of all their own nobility and knights, and who are jockeying for leadership among themselves – divisions that Hellequin skillfully encourages. Hellequin is supposedly trying to find and collect the Black Armor of Nuhy, which was divided among the victors after Nuhy’s death in battle. Some believe that this is just Hellequin’s pretext to use Nuhy’s name and armies for his own benefit, while others believe that Nuhy had real demonic powers, and that he will be resurrected if Hellequin does find all of his Black Armor. There are more complications, and volume 2, The Prophecy, ends with Garen, the other three Companions of the Dawn (Sir Grimbert, fox; Lord Arthus, bear; and La Fouine, marten), and the peasant refugees left behind the Wall of Ambrosius where they are supposed to be safe, suddenly attacked by Skernovite pirate raiders led by their King Rothgard the Bald (hawk) and Hellequin’s lieutenant Sigwald the Rash (bull terrier).